• Increases the flow of the acrylic paint. • More effective than adding water to the acrylic paint. • Does not cause the acrylic paint to break down the way water does. • Adds substance and body to the acrylic paint. 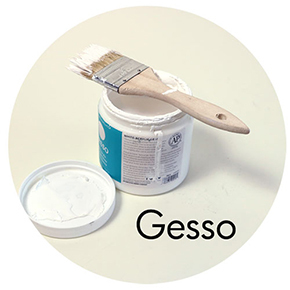 • Thick, sturdy, water-based paint which can be watered down to create effects like watercolor. • Dries quickly, don’t let it dry in your brushes! • Use a palette knife for mixing, acrylic is too thick to mix with a brush. 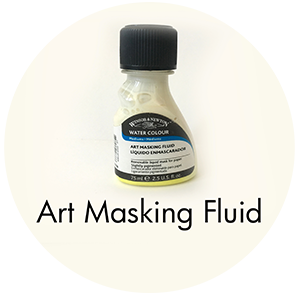 • Paint the masking fluid onto areas of your watercolor painting that you want to stay the white of the page. • Once dry, paint with watercolor around the masking fluid. • Last step is to peel off the masking fluid to reveal the white of the page. • Pulls and stretches the canvas. • Prevents you from having to use your hands. • If you try to stretch large scale canvases without canvas pliers, your hands will hurt! 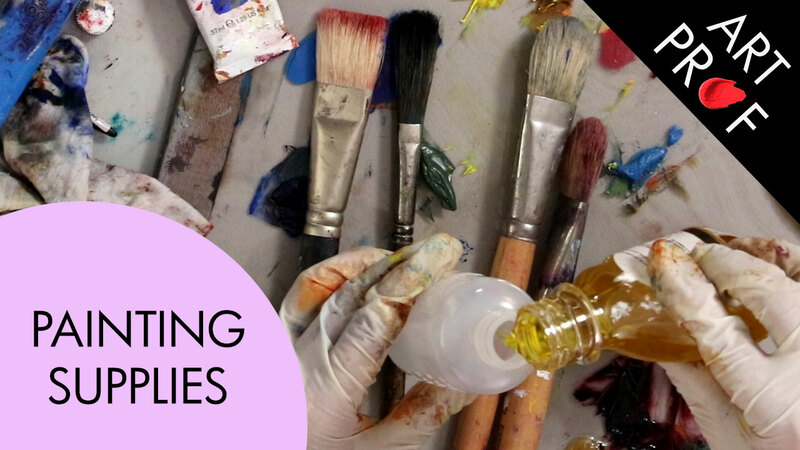 • Very effective for stretching large scale canvases. • Comes in different sizes and widths. • Wider pliers are more solid, but also less flexible to work with. • Not necessary for small scale canvases. • Great for lighting a still life, a model, or your artwork. • Portable and light weight. 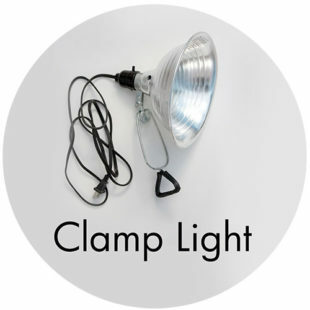 • Easy to attach & position the direction of the light because of the clamp. • Ranges from affordable to expensive. 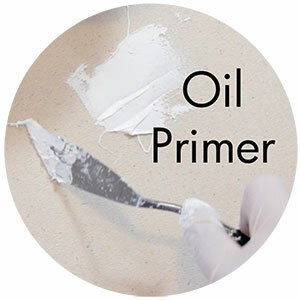 • Primer for acrylic and oil painting. • Clear, which makes it possible for the texture of the painting surface to show through. • Especially effective on wood, where the wood grain pattern shows through. 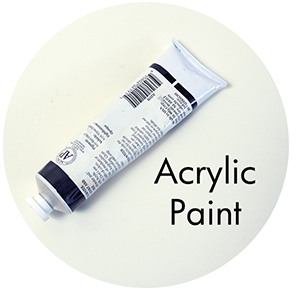 • Inexpensive way to add body to your acrylic paint. • Creates a gritty, textured surface to acrylic paint. 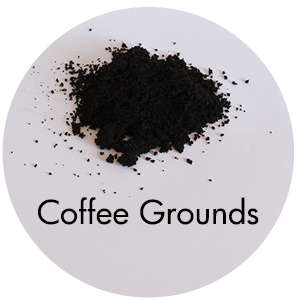 • Best of the coffee grounds are dry when added to the acrylic paint. 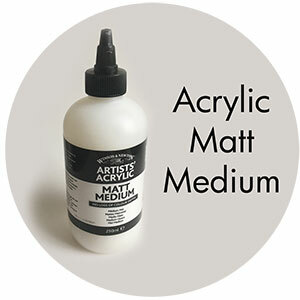 • Can be added in different ratios to the acrylic paint to create a range of textures. • Wax-covered paper to be used as a palette for painting. • blue tapeUse to tape down on the table. 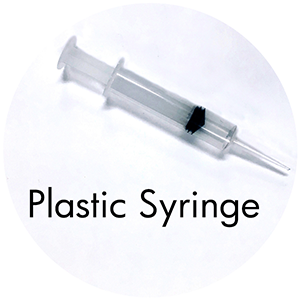 • Tear-off for easy storage and very fast clean up. 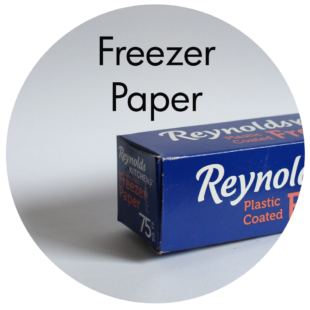 • You can cut pieces of a used freezer paper palette to reference dry paint mixtures. • Very convenient & affordable. • You can control how large your palette is, make it small or very large! 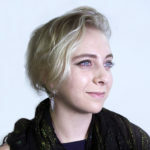 • Great primer for priming canvas, paper, and more! • Acts as a barrier between the raw surface and paint, which is important for oil painting since oil paints will eat through raw canvas. • Varies on consistency and texture depending on the brand. • Consistency can be changed by adding more water. 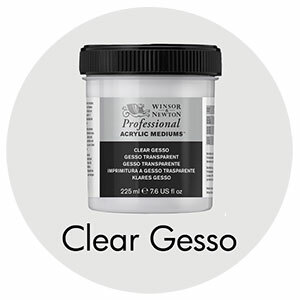 • Thicker gesso is better to get because you can easily adjust the consistency. • After drying, can be sanded for a smoother surface. • Very permanent palette that lasts a long time. • Extremely easy to clean with a window scraper. • Can be used for either acrylic or oil paint. • Make it yourself with foamboard, a sheet of grey paper, a sheet of glass, and duct tape. • Very sturdy, stable surface to mix paint on. 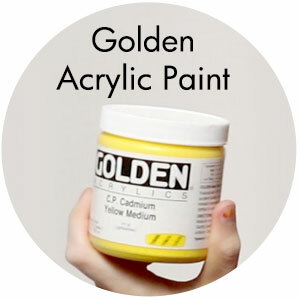 • High quality acrylic paint. • Doesn’t have filler like other acrylic brands, has strong pigment. • Thick, juicy, and substantial. 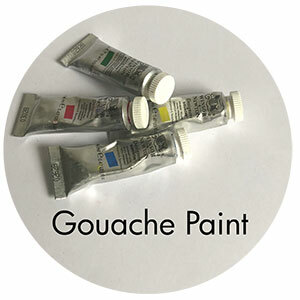 • Winsor & Newton Designer’s gouache is an excellent, high quality gouache. • Consistency is in between watercolor and acrylic paint. • Can be used transparently or opaquely. • Best tool for mixing paint. 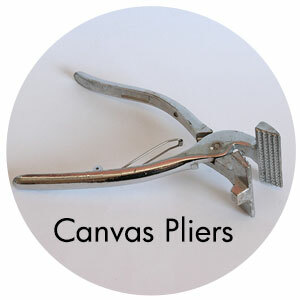 • Terrific tool for applying paint to the canvas. • Easily cleaned with a cotton rag. • Offset blade makes for easy handling. • The best shape is the one that works for you! • Way more effective than mixing your paint with a brush. When you mix with a brush, your brushes get chunked up with paint and it’s much harder to keep your colors from getting muddy. 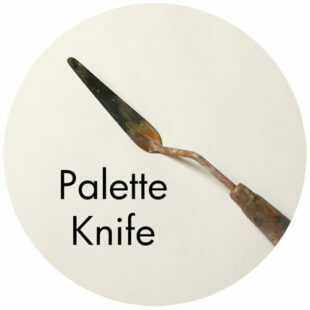 • Terrific tool for applying paint to the canvas, really great for creating textures and depth. 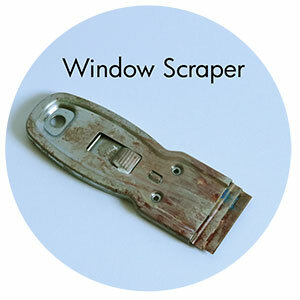 • If your palette knife has dried paint on it, scrape it off with a window scraper. • Very time consuming, but worth it because it stretches the canvas very tight. • Must be used in conjunction with oil primer, cannot be painted on directly. • Use the exact measurements on the package, incorrect measurements can result in your painting cracking right away. • Use with boiling water. • Overnight, the rabbitskin glue will set like jello. 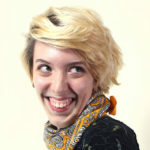 • Dispose of the rabbitskin glue when it is like jello, never reheat. 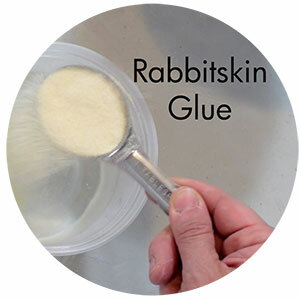 • Clean your brush right away after applying rabbitskin glue, or it will harden the brush bristles. 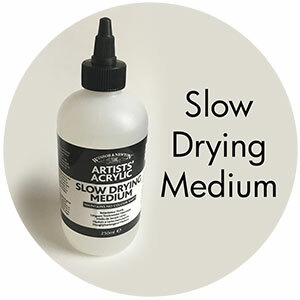 • Mix this medium into acrylic paint to slow down the drying process. • Dilutes the paint, makes it more transparent, colors will not be as rich. • Terrific for storing small bits of art supplies. 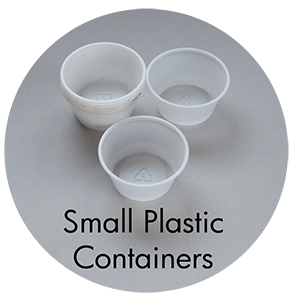 • Great for storing acrylic paint mixtures because they have lids. • Good for mixing ink wash gradients. • Terrific for a different way of dispensing paint on your surface. • Make sure you clean thoroughly after use! • Easily clogged up if you don’t clean up. • Works best with acrylic paint. • To clean your brushes, press your brushes against the metal coil. • Since the metal coil is raised, your brush never has to touch the bottom. • The crud will settle to the bottom, and the solvent will become clean. 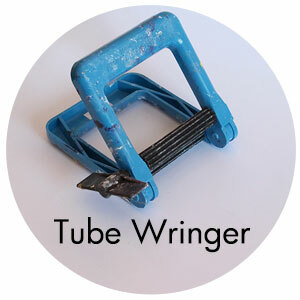 • Great for paint tubes that are almost empty, but not quite! • Use on soft painting tubes. • Lets you squeeze every last drop of painting out of the tube. 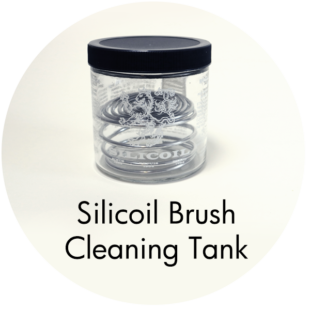 • Excellent tool for cleaning a glass palette for oil or acrylic painting. • Equally effective with dry and wet paint. • After use, must be cleaned thoroughly with a cotton rag so that the razor blade is removable later. 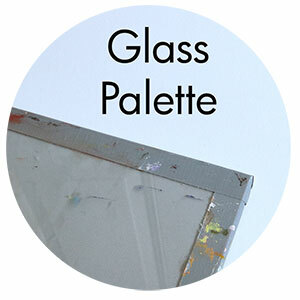 • Scrapes through the paint and creates a perfectly clean glass palette.